What is new in the latest SynthFont2 versions? - Quite a few reported bugs fixed! - Improved support for VST instruments, especially improved support for "bridging", i.e. using 32 bit VSTs in the 64 bit program version, and vice versa. - Introduced a scripting or macro language feature. Please read separate document for more information. NOTE: This option is always turned off when playing to the speakers in order to avoid sound "hiccups". - The 64 bit version has now been optimized and is as fast as (but not faster than) the 32 bit version. - Playback buffer size was too small for speaker output, which could cause random stuttering in the audio (for speakers only). The buffer size shown in Options was wrong (too large). - Selection of notes in the Pianoroll graph by drawing a rectangle has been made smoother and with better scrolling. - A few other UI glitches has been fixed as well. - The inbuilt SoundFont editor “Viena” crashed on start-up. Also fixed a few other “Viena” related bugs on par with ones fixed in the stand-alone version of Viena. - Many other minor bugs have been cleared. - You can now choose to have two controller views side by side. See image below. - New mix mode for VST effects. See image below. - One alternative model for the inbuilt reverb. It is called MVeerb and is based on MVerb by Martin Eastwood. It sounds better than the original Reveerb model which is fast (less CPU hungry) but has a somewhat metallic sound. See image below. - The Continuous Controller # 123, “All Notes Off” used to turn of all notes, for all MIDI channels. The new behaviour is to turn off all notes only for the selected channel. Click on a check box item in "Show here". For example "VU meters"
To remove the side view, click the button in the middle with a red cross. New mix mode for VST effects. In this example 65% Wet and 35% Dry signal will be mixed. MVeerb is an alternative model for the inbuilt reverb. - The usual range of minor bugs eliminated. - SynthFont2 now comes in two flavours: a 32 bit version (the “old” SynthFont2) and a 64 bit version (the new SynthFont2x64). Both versions are able to use VST plugins of any architecture. The 64 bit version can use 64 bit plugins natively and 32 bit plugins through the included VST Bridge (SFVST32TO64). The 32 bit version can use 32 bit plugins natively and 64 bit plugins through another VST Bridge (SFVST64TO32). - The usual range of suspects lined up and killed. On the this web site you can find a PDF file with instructions on how to use this tool. Click here to read it. 5. 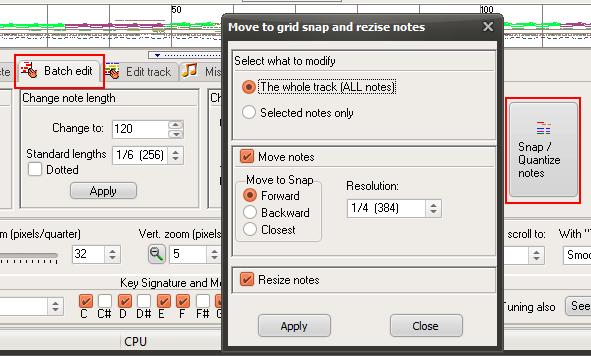 In Pianoroll | Batch edit there is a new button "Snap / Quantize notes". Use it to move notes to certain bounderies ("Snap") and /or change the length to closest standard length. 6. Full support for the MIDI event polyphonic key pressure (aka Key Aftertouch).Key Aftertouch may be sent by your keyboard on a key-by-key basis as you change the pressure on individual keys. You can now insert Key Aftertouch events either using the "Add new event" button on page Midi events, or by drawing lines in the Controllers graph in Pianoroll. 7. New button "Edit text" on page Midi events. You can use it for example to edit Karaoke Lyrics. 8. Improved handling of maximum voice count (polyphony). 9. Custom values for mixer Volume, Pan, Dynamics, Transpose and Low Pass Filter amount through new buttons: one button in the Standard Mixer header and five buttons on the Plug & Play | Track edit page. - Version 2.0.6.1 introduced a really silly bug: note velocities were not used. - Version 2.0.6.1 introduced another really silly bug: Pitch Wheel value was not used for new notes. - The Search and Replace feature on the “Midi events” has been broken for some time. - The Karaoke Lyrics feature introduced in 2.0.6.0 has not been perfect. This version makes an attempt to remedy the issues found. - The list of markers in the Pianoroll has also had some problems since 2.0.6.0. Fixed now. - In live input mode from a MIDI port, adding or removing VST effects during playback had no impact. - In Pianoroll, hitting a key on the virtual keyboard would sometimes prevent you from drawing new notes. - Some other minor report bugs fixed as well. - Since version 2.0.4.0, the program could not play an arrangement containing an audio (wav-file) track. - As always - the usual range of minor bugs and annoyances removed. - The Karaoke Lyrics window now has support for chords, encoded in the MIDI file using Yamaha's proprietary FX encoding system. - SynthFont2 makes an attempt to determine the key signature of the MIDI file when loaded. The key signature may also be encoded as a META event in the file, but the signature determined by the software may not be the same. The key signature is only shown at the bottom of the Pianoroll page. NOTE: the signature is for your information only; it is not used anywhere in SynthFont2. - The list of Markers to the left on the Pianoroll page has some new features: 1) in Setup and Options you can tell SynthFont2 to always sort them automatically in increasing time order. If you do not switch this function on, you have the option to manually move markers you have created using drag and drop. 2) Double-click on a marker to edit the name and the time. - You can now let SynthFont2 set the range of notes shown in the “mini Pianoroll” windows on both the Pianoroll page and the Plug & Play page. Use the right mouse button for an option menu. - On the Plug & Play page, you can now resize the “mini Pianoroll” by dragging the new divider bar below the graph. - Tentative new feature: The Advanced Playlist, found in Files & Folders. Use this script-based feature to automatically create a range of audio files for one or more MIDI files. For example, a choir manager can create audio files for various combination of voice volume levels; “solo” = all voices (=tracks) muted except one, “half-solo” = all voices set at half volume level (or any other) except one, “missing” = all voices sounding at defined volume level except one, which remains silent. See the include file "AdvancedPlaylistExample.txt" for more information.